Kites, made up of a diamond-shaped tissue paper and two strips of bamboo, invariably catches the fancy of everyone, as it soars high in the sky, deftly manoeuvred with a string held by human hands. On January 14 every year, Ahmedabad celebrates the festival of Makar Sankranti with impromptu kite contests that commemorate the skills of both making and flying kites. 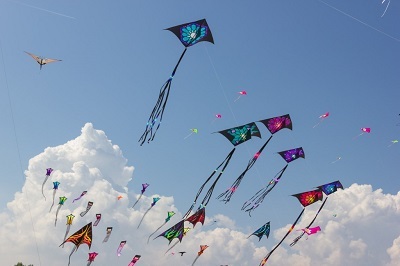 On this day the skies over the city are liberally dotted with colourful soaring forms; the kites are made in several sizes to suit child and adult, amateur and professional alike. The decoration ranges from the extremely plain to the highly elaborate. In spite of this variety, all kites share the same dominant structural design. The square body of the kite has a vertical diagonal held by a straight bamboo split while the horizontal diagonal holds the arched bamboo split. Both splits are firmly anchored to the paper square with small paper stickers; the boundary string which holds the bamboo and the paper strengthens the paper edge when it catches the wind as the flier tugs at the string while maneuvering the kite. 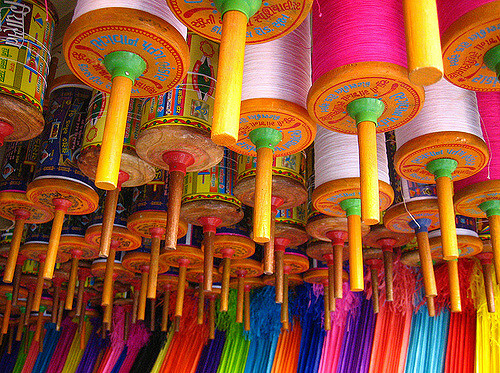 Manja, the kite flying string, is made of cotton thread that is covered by starch and glass powder in order to grant the string strength as well as enable the kite flyer to successfully cut the string of an opponent’s kite. Bamboo splits are sourced from Assam and craftsmen travel all the way from Uttar Pradesh and Bihar to Ahmedabad for the kite making season. The tradition of flying kites is not a new phenomenon in India. Many experts believe that kites were first brought into India by the Chinese travellers, Fa Hien and Hiuen Tsang but from there theyhave become a part and parcel of Indian tradition.